SAJ Dance Productions promotes positive confident attitudes. We teach the values of hard work, dedication, team cohesion and physical core strength to extract the best that the student has to offer. Read more about our method of teaching on our about page. Ballet is a classical dance form demanding grace and precision and employing formalized steps and gestures set in intricate, flowing patterns to create expression through movement. Our classes broken down in the following age groups: 3 to 5, 6 to 9, 10-13 and 13 to 18. Jazz dance combines techniques of classical ballet and modern dance with the current forms of popular dance. Jazz also has its own movement vocabulary ranging from the isolation of certain body parts to the movement of the entire body with the accents of musical rhythms. Jazz dance can take on many different characteristics and styles, including Street Jazz, Percussive, Broadway, Contemporary and Lyrical. Jazz classes can be patterned in any of these styles or a combination of them. Emphasis is on the importance of energy, rhythmical accuracy, and style. These classes are divided in 3 levels. 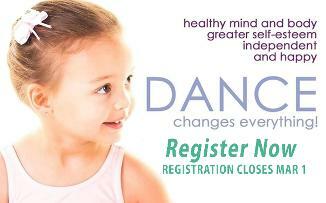 Beginning (ages 4-6), Intermediate (Ages 7-12) and Advance (13-18). Tumbling Class - Children will focus on beginner tumbling skills such as forward and backwards rolls, handstands, bridges, cartwheels and back-bends. The only equipment used is the floor and trampoline, as the primary focus of this class is the floor exercise and tumbling skills.